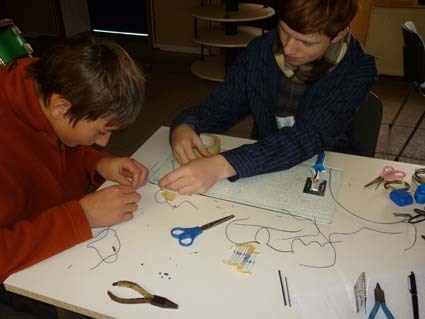 Gamepad bending workshop lasted for 3 days in IDEE (Dresden, Germany). During this time I invited participants to re-think the concept of video games and encouraged to create a new and much more active interface for video games. The outcome was “Drum Ball”. We opened the game pad and transformed old buttons to the drum and sticks. It means, while playing the drum, one is able to play a video game as well. 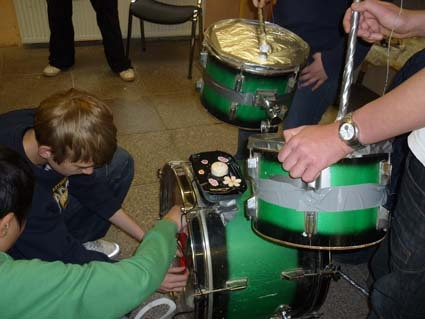 It is possible through the contact between the drum surface and the sticks that are covered with silver paper. It means hitting the drum surface with the sticks triggers contact in the gamepad and the game can be played.